I used to use 2-Alarm Chili mix and then decided that I can do the spices for a lot less, so here is my version of my chili. Using a wide bottomed 4 or 5 qt (4 or 5 L) pan, add olive oil and sauté onions and garlic until the onions are translucent. Add hamburg sauté, breaking up the meat into small pieces. 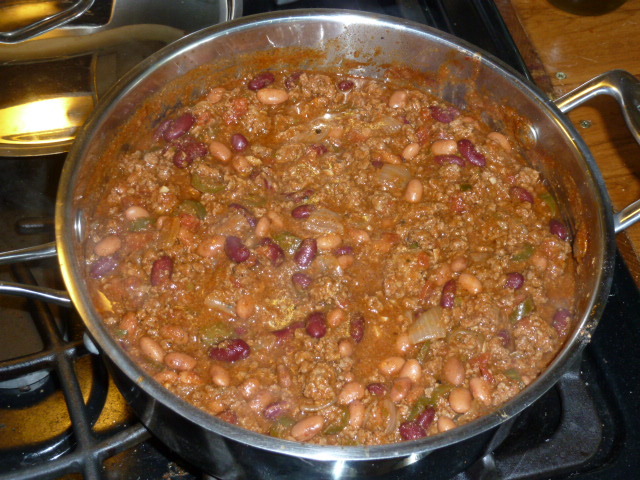 If a high fat meat was used, I would sauté in a separate pan, adding the meat to the chili pan when the fat has been rendered being careful to separate the meat from the fat. Add diced tomatoes and Mrs. Wages Salsa mix. As an alternative you can add 2 cups (480ml) salsa in place of the tomatoes and Mrs. Wages seasoning packet. Add two cups of water, hot jalapeño slices and rest of the seasoning, plus cornmeal, except for the cooked beans. Cook on a slow burner for 30 minutes for more. The last five minutes, add the cooked beans. Serve the chili over crushed taco chips or rice. Top with cheddar or monterey jack cheese, pice de gallo and/or sour cream.